They’re local celebrities, Puget Sound hallmarks, key ecosystem players, and, unfortunately, endangered. 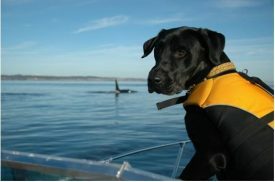 Although they should be rebounding from (now banned) live harvest captures in the 1970s, the Southern Resident killer whale (SRKW) population has remained relatively stable at low levels for years. Recovery looks grim: as much as 69% of detectable SRKW pregnancies end in abortion and explanations have eluded scientists until recently. Now, researchers from the University of Washington (UW) are getting closer to some answers thanks to a crew of unlikely heroes—poop-sniffing canines.